This is a place I've been meaning to share for awhile now, but have held back waiting for the right time. Point Reyes was one of the places I read about (and pinned) before moving out here. From the famous lighthouse to the stunning beaches and the plethora of wildlife, I knew it was a place we would have to visit. Now that we've been three times, I have way too much to share on one post so I will leave the beaches for a second post and talk about everything else in the first. The first time I visited, was with my dear friend and although I enjoyed the lighthouse, all the grass was dead leaving the scenery a bit disappointing. I guess that is all relative though. A few weeks ago, we decided to give it another try and because of the recent rainfall the whole area had really greened up making it even more scenic than I could have imagined. 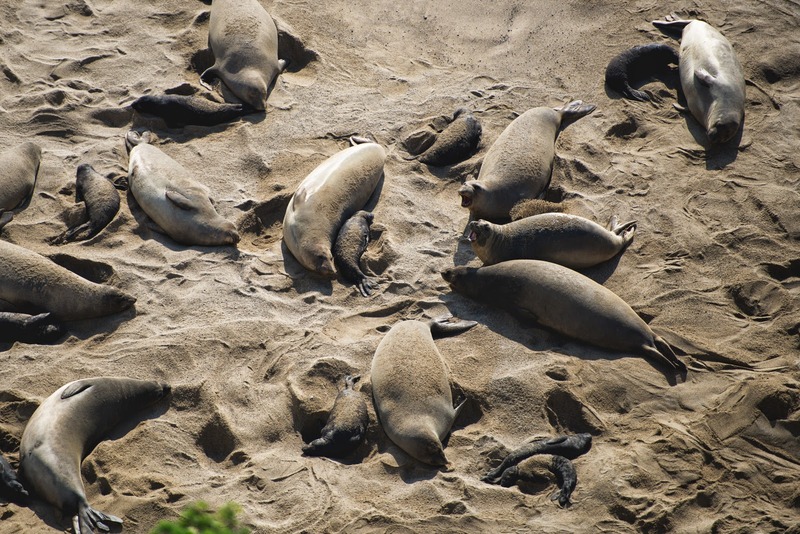 Our third trip occurred this past weekend, at the height of the elephant seal birthing season and grey whale migration past the seashore. This visit was also very enjoyable, as seeing all the wildlife really helps to separate this area from all the other pretty beaches. 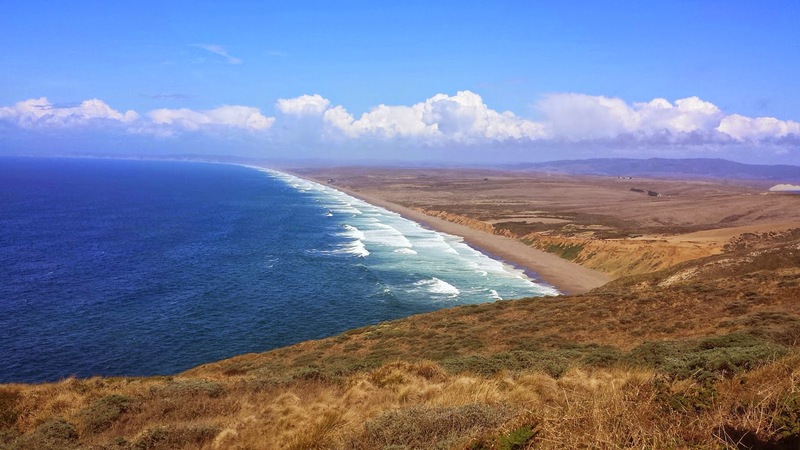 Point Reyes National Seashore is about an hour and half North of San Francisco depending on the route one takes. You can take the long way, and put yourself onto Route 1 which hugs the shoreline for a good part of the way and offers stunning views. 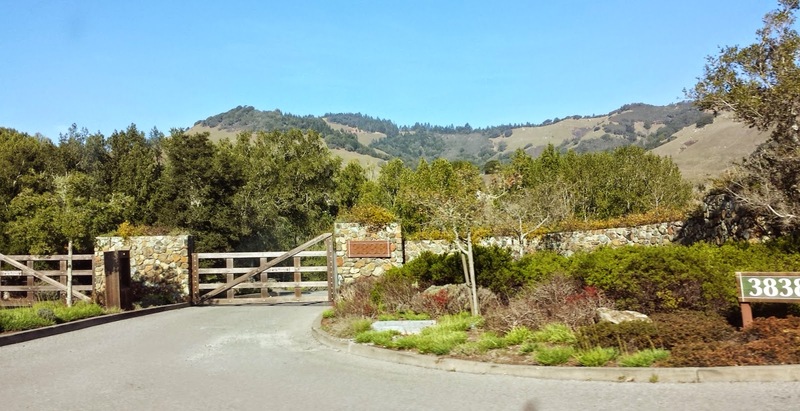 On this route, you pass through the cute beach side town of Stinson Beach and, although we didn't stop, it seemed like the perfect place to stretch a day trip from the city into a nice relaxing weekend getaway. The other route, from the expressway outside of the city, gets off onto LUCAS Valley Road passing the most inconspicuous headquarters of Lucas Film Animations (we only knew because google maps had it marked) and a Redwood Forest before heading through the town of Point Reyes Station. Both paths come together at Sir Drake Blvd right before a wetlands area. Here, at the last bit of civilization before entering the Seashore, you can stop at the store for some food or beverages and if you do, don’t forget to walk around back to get a glimpse and a picture of the iconic Point Reyes boat. Either of these routes and the entire area would be an enjoyable place for a short weekend getaway as we never have enough time to stop and explore it all maybe we will be able to do just that at some point. We are always on a mission to get to the seashore. At one point the road splits and if it were not for the signs pointing to Point Reyes, you'd be sure you should have gotten off Sir Francis Drake at the split. From beautiful marshland, you suddenly enter farmlands. 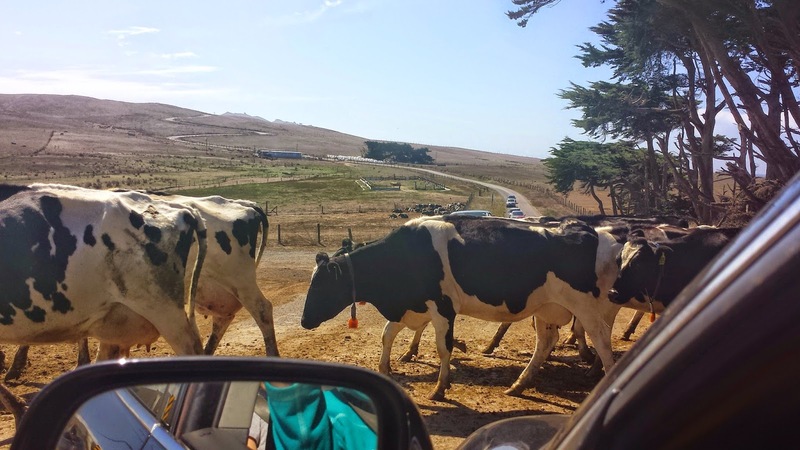 A 12 mile drive on winding roads takes you past a number of massive ranches before ending at the cliffs of the ocean. One day, I’m going to have to learn about the history as all of the ranches are marked historical with different letters representing them. And as Marty and I found out on our first visit, they are very much in working order as we were delayed by a herd of cattle passing across the road. These cows and other wildlife such as elk and deer have some pretty amazing scenery to enjoy as they graze on the grass on the cliff side. Can you spot this lucky deer unaware of anything but the grass to munch on? Often known as one of the foggiest and windiest places on the West coast, we've been very fortunate and had beautiful weather every time we've visited. It was so sunny last weekend that our shadows followed us where ever we went which was much to the pleasure of our little one. He says his shadow proves that he is almost big like us now. 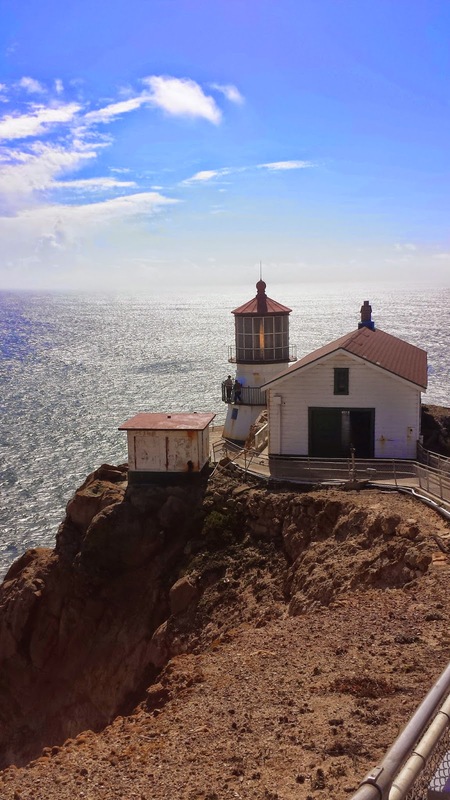 Although this post is a hodge podge of my visits there, our first (and should be anyone’s first) stop was to the Point Reyes lighthouse. After parking, it’s a short, mainly uphill hike to the visitor’s center. On the way up, the vast expanse of South Beach becomes visible on the right. Once at the visitor’s center, you can take peak at some of their information on the current whale sightings and other animal presence on any given day. When we arrived last Saturday, more than a dozen sightings of Grey Whale pods had already been recorded that day. Turning the corner outside the visitor’s center suddenly the lighthouse appears. Way, way down at the end of a very long and steep staircase. A sign at the top cautions people that going down to the lighthouse, means coming back up. 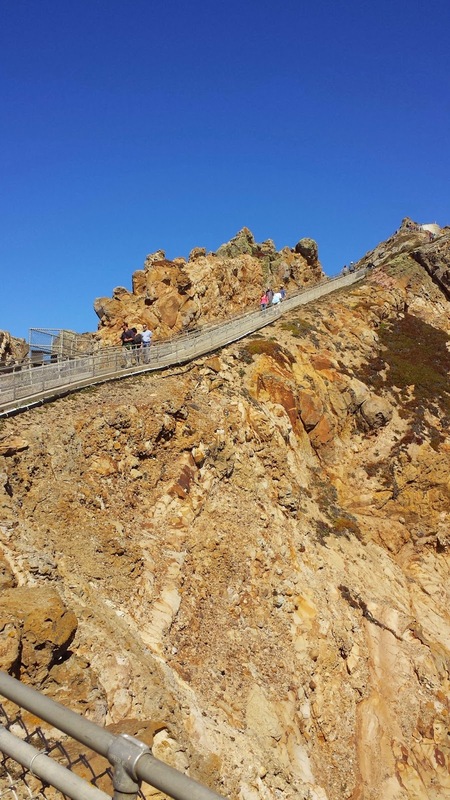 It is no joke, but a sectioned off viewing platform allows anyone who doesn't want to make the trek a great place to rest and look for whales. Often, there are volunteers at this post who are also looking for whales, have a lot great information, and are happy to teach the curious. 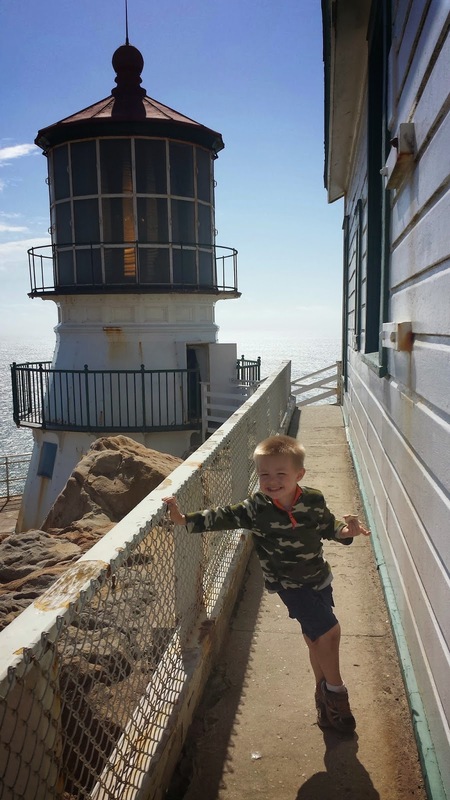 If a little sweat doesn't bother you, the lighthouse is worth it and Landon has made his way up and down twice now so it is completely doable. Not to mention, the scenery is breathtaking! Still functioning, you can hear the air horn every minute or so still alerting ships of the dangerous cliff. The inside is usually open for a peak inside at the light. I found it pretty amazing! 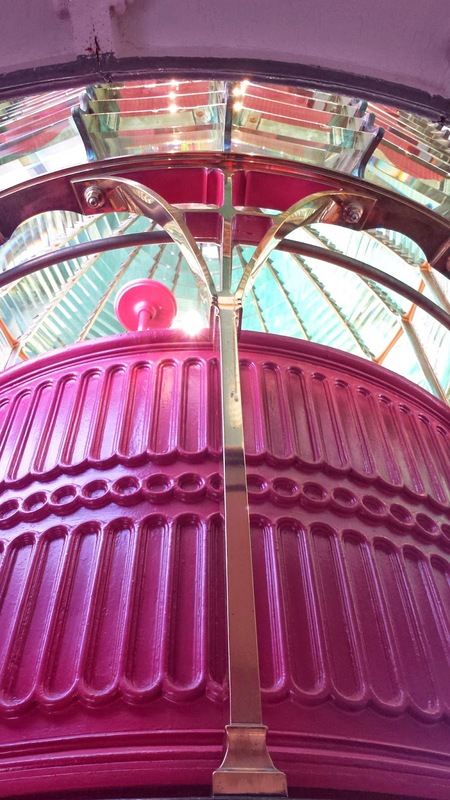 Inside the bottom there is a lot of information about the history of the lighthouse which is worth the quick read. 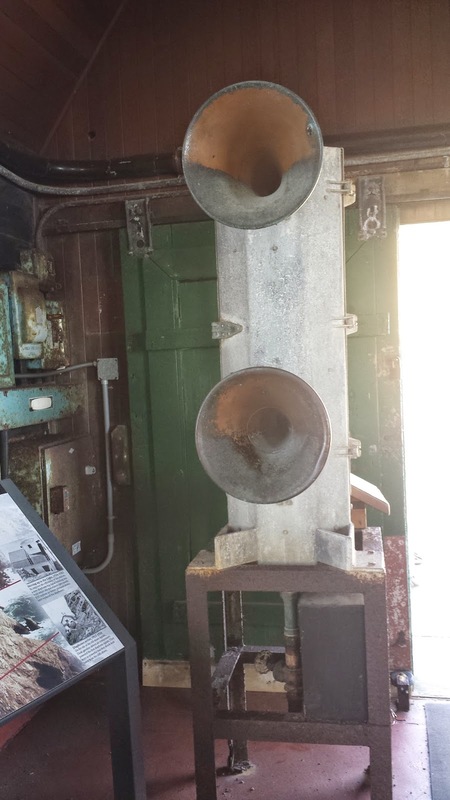 The adjoining building, which housed the now extinct equipment used back in the day, is on display as well which gives you a sense of what it was like to run a lighthouse 100 years ago. You can walk all around the outside of the lighthouse as well and enjoy the waves crashing along the rocky cliff. We brought out binoculars and looked for whale blow spouts in the distance. This is the tail end of the Grey Whales Southern migration from Alaska to Mexico. In the warmer waters they will give birth to their young and then start the journey back North in the Spring. I've read that when they make the trip back to Alaska they're much easier to spot and more active. With their young in tow, they tend to stick closer to the shore and are often spotted teaching their young tricks along the way. As you can imagine, I've already made a note in our calendar to visit again at the end of March. Despite being the largest mammals, they were not easy to spot so after a bit of watching we decided to move on to other animal visiting this time of year. Of course, that meant walking back, all 308 steps! They even have them numbered so you can know how far from the top you still are. After the lighthouse, we headed over to Chimney Rock. A short 2 mile hike out along a peninsula, this hike was so much more enjoyable with the green grass. Compare the two pictures taken in just about the same spot. 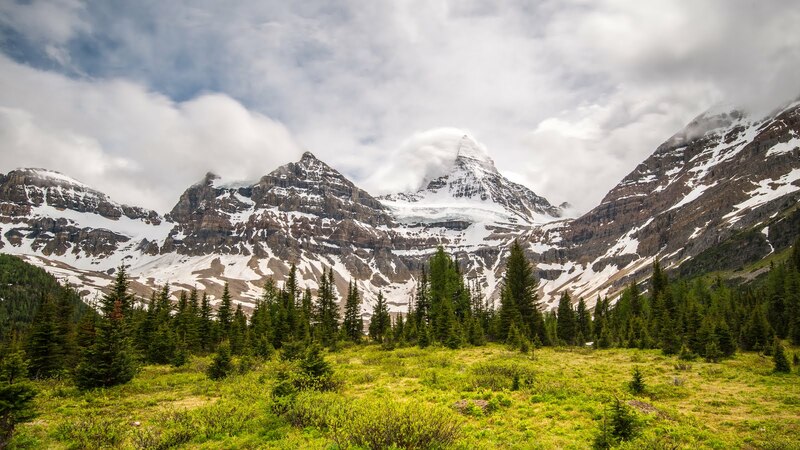 The one on the left was taken in September during the driest time of year and the one on the right was taken just this last weekend. Now maybe you can understand my initial dissapointment. Beyond the green grass, there were a number of blooming flowers along the path and the few tree were swollen with acorns. I just love all the different acorns on the various evergreens. 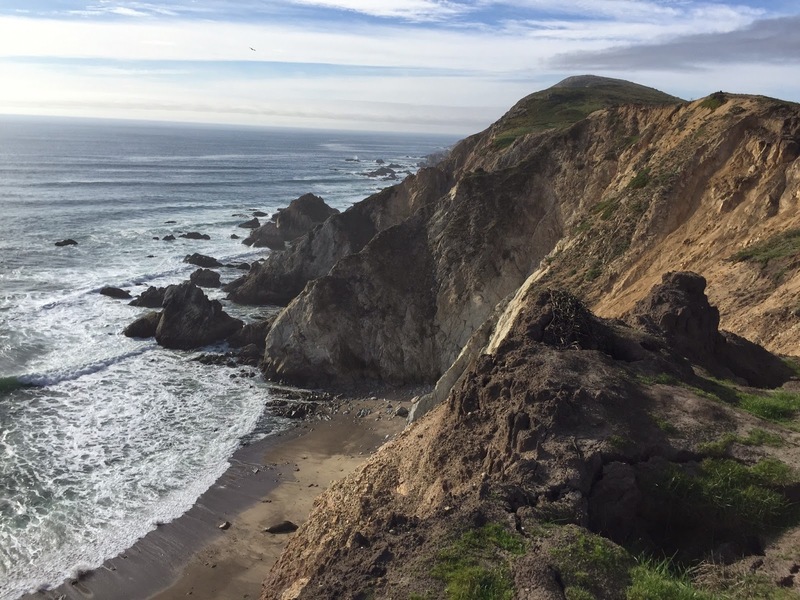 As you get further out on the hike, the land becomes more and more narrow leaving expansive views of Drakes Beach to the left and a beautiful rocky cliff on the right. As we left the parking lot and started walking we could hear them, the Elephant seals. Their loud and constant barking wasn't exactly what we expected them to sound like. I knew of a secret cove along the way where we had spotted some the first trip. We opted for this spot instead of the more crowded seal overlook. These ladies know how to pick some prime property. When we visited in September, there was a number of seals sun tanning, but last weekend the number had tripled. Most of them had their newborn pups along side of them. Elephant seals, especially males, are not the cutest animals on the planet, but the babies sure are. They were nursing, sunning, and cooling off in the sand. You could tell that some of the pups were brand new and number of seals were super swollen yet to give birth. We even watched a couple fight. Can you tell Landon was a little nervous at the edge? Which is a good thing too, because one mistake and off the edge you go. We took our binoculars so we could all take turns looking at the babies up close. It is so much fun to be able to show Landon these animals up close and teach him while he experienced it. The weekend before, I had read all the information about them, so I shared with my boys as we stared down on them. Adam even took the opportunity to share with Landon a new science experiment. Luckily, it was only a piece of grass that they burned. Landon tried to do it on his own, but he had neither the patience nor stability to hold it in the same place long enough. And who wants to catch grass on fire when you can enjoy this view instead? The answer is boys. We watched the seals and their babies for a bit before heading to Landon’s favorite place…the beach. As I said in the beginning, these three visits made it just too much for one post (anyone still with me?) so I'll share the beaches tomorrow. I'll end this post with two short videos we took. Adam took the first with his camera so he is able to zoom in a little better. The second, I took with my *new* iphone. The ocean and our lack of decent audio equipment make it hard to hear them, but listen closely and I'll give you a hint, those are not birds. HERE is part 2 on the beaches if you want to read more! Perks, you will have to visit again sometime. There is so much to do and see. 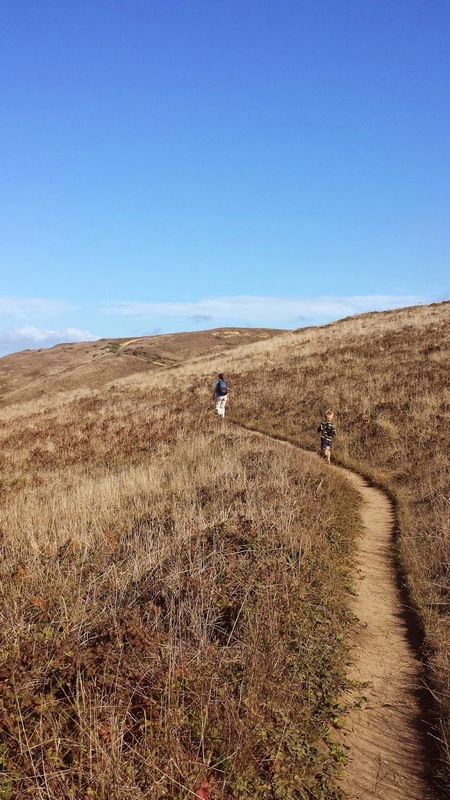 Next on our list, is the Palomarin Trail to Alamere Falls. Thanks for visiting!